Maserati showcased their new Levante GTS for the first time at the 25th Goodwood Festival of Speed. The World Premiere of the V8 Maserati of SUVs is the sibling version of the top-of-the line Levante Trofeo, which also made its European debut at the prestigious automotive event. The Levante GTS Twin Turbo V8 is assembled by Ferrari in Maranello and preserves the V90 architecture of the 3.8-litre unit fitted in their popular Quattroporte GTS but has been re-engineered to work with the Q4 Intelligent All-Wheel Drive System and retuned to deliver 550hp at 6,250 rpm and 730 Nm peak torque between 2,500 and 5,000 rpm. Thanks to its exceptional weight/power ratio of 3.9 kg/hp the Levante GTS achieves performance figures of a modern supercar disguised in a high-end SUV body. It takes only 4.2 seconds to reach 100 km/h, while its top speed is 292 km/h. 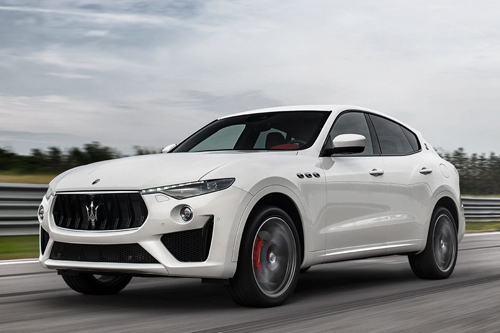 The rigid and perfectly balanced Levante chassis has been tuned to effortlessly handle the immense power of the GTS engine, providing a driving experience true to the “Gran Turismo” pedigree of this new V8 Maserati of SUVs. The Levante’s unmistakable design epitomised a new level of sportiness in the Trofeo version and the new GTS has adopted a similar style theme, which spotlights on the lower front fascia and the rear bumper, achieving a sporty yet elegant look. Interior designers have come up with sophisticated ideas to build an extraordinary environment within the Levante GTS cabin giving it with standard Full Premium leather or full-grain Pieno Fiore natural leather as an option, sport pedals and Harman Kardon Audio system with 14 speakers. Alongside the V8 campaign, the Levante range now boasts new features, such as the Adaptive Full LED Matrix headlights as an option and standard Integrated Vehicle Control (IVC), which is already available on the Ghibli and Quattroporte saloons. Rather than simply correcting vehicle instability, the IVC function helps prevent it, providing enhanced active safety, improved driving dynamics and an even more exhilarating performance. Subtle upgrades and new content for both Maserati saloons and the Levante. All Ghibli, Quattroporte and Levante versions have taken on the redesigned gearshift lever previously introduced in the Levante Trofeo, featuring a more intuitive shift pattern, shorter travel and improved operation. The driver now has the option to use the eight-speed ZF gearbox in automatic or manual mode simply by shifting the lever from right to left, while a new ‘P’ button effortlessly sets the transmission into park mode. The MTC+ infotainment system on all three models has been enhanced with updated display graphics and improved climate control system ergonomics. In their lavish interiors, Maserati introduces full-grain Pieno Fiore leather for the first time, which is incomparable to any other material in the automotive industry for its natural, soft feel and the unique character it develops throughout the years. Pieno Fiore is standard in the Levante Trofeo and available as an option in all Levante, Ghibli and Quattroporte versions in three colours – black, red and tan with specific stitching on the seats and double stitching on the door panels. Maserati also offers two brand new high-gloss interior trims for the Ghibli and Quattroporte and three for the Levante. On the outside, colour ranges have also been refreshed for MY19 with a choice of ten colours for the Quattroporte and eleven for both of the Ghibli and Levante models. Two new tri-coat colours are now available, developed to enhance the design of each, Rosso Potente and Blu Nobile. Five brand new alloy wheel designs have been introduced in the MY19 catalogue in 20 and 21-inch sizes, two for each of the Levante and Quattroporte models and one for the Ghibli. The 22-inch Orione forged aluminium wheel is exclusively available for the new top-of-the-line Levante GTS and Trofeo.